The spring 2016 season of anime is not just about Attorneys. We have the long awaited fourth part of Jojo’s Bizarre Adventure called Diamond is Unbreakable. Set years after the events of Stardust Crusaders, we are introduced to yet another Joestar: Josuke Higashikata, son of Joeseph Joestar. That’s right! 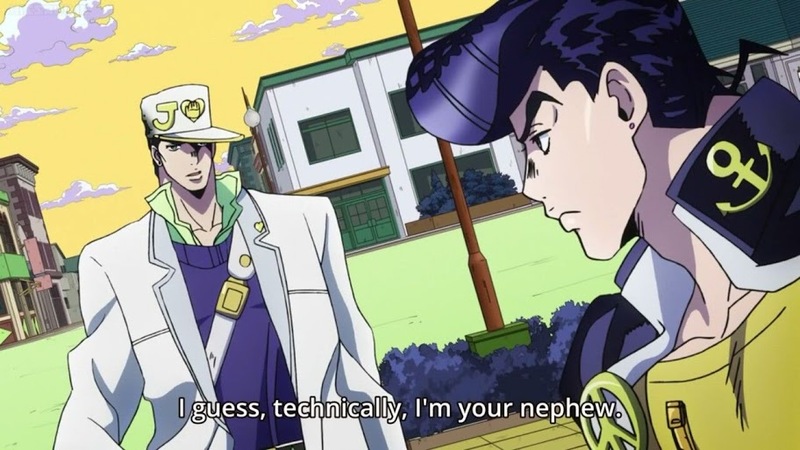 Joeseph had an affair which would mean that Jotaro is Josuke’s nephew. We are about 5 episodes in on this series and so far its a solid follow up to the last three parts. Long time no see Jotaro! Like Jotaro and Joeseph, Josuke has a stand. His stand however has the unusual power of healing people. This allows him to seriously injure his opponents but heal them just in time so that he doesn’t outright murder them. This leads to him disposing of enemies in some rather interesting ways. He can also do this to prevent his friends and family from being seriously injured….by injuring them more and healing them right away! His stand does have its limitations however. He is unable to heal himself or someone that is already dead. In comparison to Jotaro, Josuke appears to be a lot friendlier towards other people that is, until you insult his hair…. This is his mother by the way! Unlike Stardust Crusaders, especially Battle in Egypt, Diamond is Unbreakable uses a lot of really bright colors which make the characters and setting really pop! At first I wasn’t a huge fan of the slight change in art as the higher saturation seemed to actually make the character designs look slightly less detailed than before, but I got used to it. For some reason the second episode appeared to be much better animated than the first one. 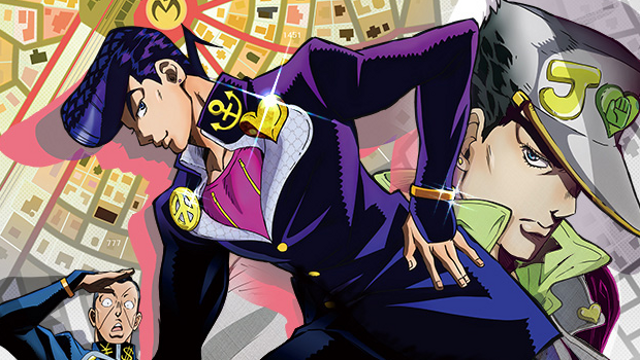 But if anything can be said about Diamond is Unbreakable, it is that it is oozing with style! just look at this opening! Stands were a major part of the Jojo series starting from part 3, Stardust Crusaders. The thing was we never really learned too much about how people were able to use the stands, we kind of just accepted it as “They have this ability, some since they were born and they can do crazy things”. In Part 4 we actually get to see people gain the ability to use them, particularly those who were not born with the ability. Of course this is nothing new for those of you who have already read the manga, so you already know what to expect. However the Diamond is Unbreakable manga is a bit infamous for having a fan translation floating around the internet that is inaccurate to say the least. With this new set of subtitles we will finally get a translation that’s a bit more accurate to the source. 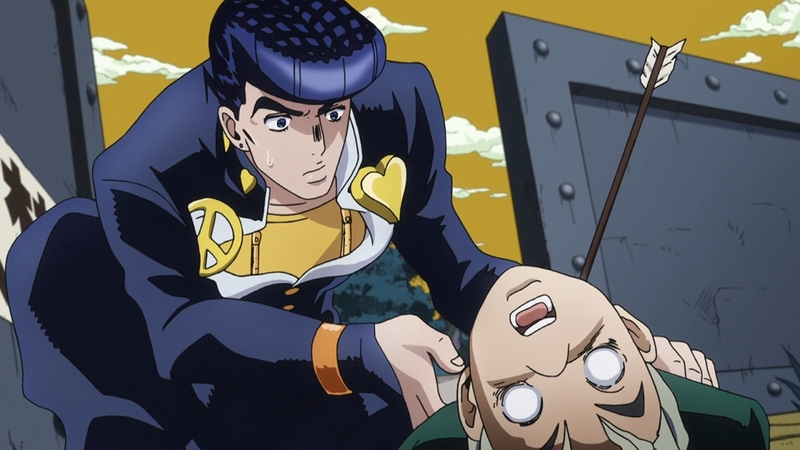 Are any of you currently watching Jojo’s Bizarre Adventure Part 4: Diamond is Unbreakable? The series is currently streaming on Crunchyroll.